Create a unique mosaic stepping stone for your garden! Download this free pattern. 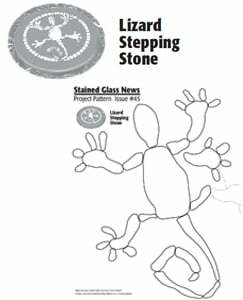 Pattern features a fun and funky lizard you can make using stained glass, a mosaic mold and basic tools and supplies. Design is courtesy of our friends at Stained Glass News. Visit their website www.stainedglassnews.com for more information about their full-color, project-packed newspaper, back issues, and subscription information.